Making overnight oats ( uncooked oatmeal) ahead of time really makes life easier, prep time is near nothing (5 minutes), I can just throw what ingredients I got into a bowl/jar the night before - pop it in the fridge, and in the morning my healthy vegan, gluten-free breakfast is ready to eat or take with me anywhere I go! So what got me to actually create this recipe for you guys, years after I discovered the all mighty power and deliciousness of overnight oats.. is FRANCE! Well not France actually, but kinda because honestly not to be dude Gwen or all my family and friends in France… is they are like 10 years behind on the food scene! Everyone thinks that France has all this amazing food, and perhaps they have some amazing non-vegan foods, cheeses, wines and other unhealthy foods.. but as far as vegan food or even just healthy food ideas in general- they are WAY BEHIND. Point of this story is that when we are in France almost EVERYONE is asking us what the heck we are eating in our Jars, under out smoothie bowls, and in our IG Stories- for breakfast. Not only do they have NO IDEA what Overnight oats are, but often they don’t even know what Oatmeal is..at all.. and have NO clue how to make it. hahahaha.. which just seems insane to me, but who knows, I would probably say the same thing to them if they ask me if I know what some crazy french breakfast pastry is.. so I won’t hate anymore (and i’m not hating at all, I am 1/4 French and love France). The cool thing about overnight oats is there are NO RULES! You can literally create ANY type / flavor of oats you want. You like Peanut Butter Banana, easy! Perhaps it is a Blueberry Vanilla kinda day, you can do that so so easily. This recipe is just a starting place, and I will link to some of my favorite food bloggers recipe posts for other flavor ideas to get your brain spinning about what you can do with these babies! 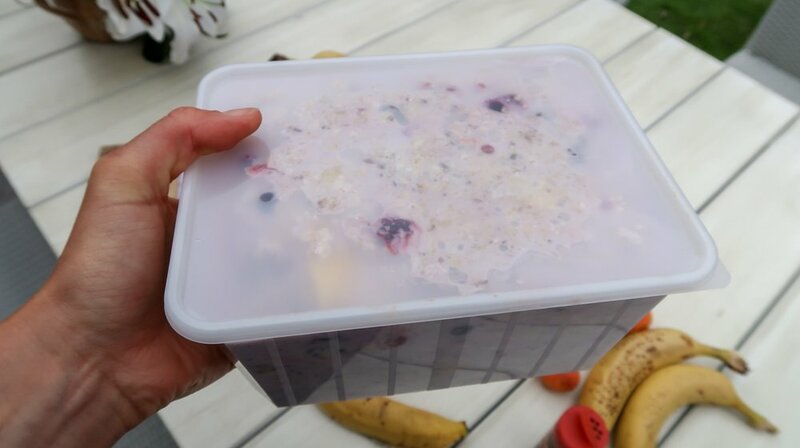 In my daily overnight oats I ALWAYS add a a few of the same ingredients because 1) they are really yummy 2) they are really healthy, 3) I can always find them. So here they are! I love the thickness, texture and taste of old-fashioned oats, however plenty of people like steel-cut oats as overnight oats (but I think they are too chewy) and others like quick oats (which I avoid if possible because they more processed and therefore less nutritious). 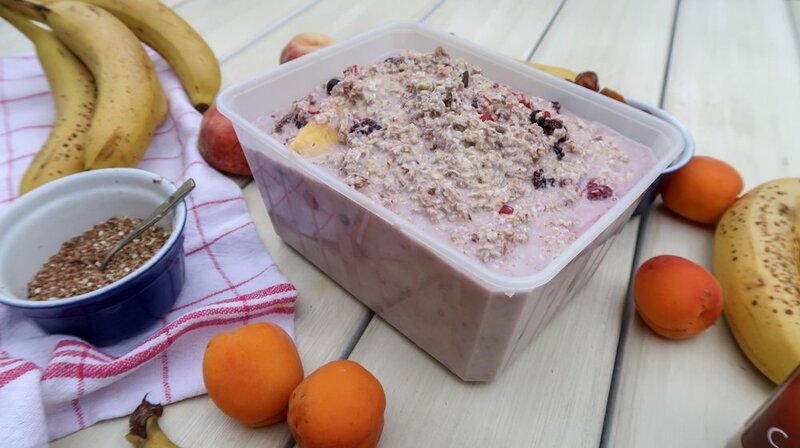 However while in France we often can only find quick oats, and those are what we used here in these photos. If you have not yet experienced the amazing texture of chia seeds and ground flax seeds in your oatmeal or oats, you gotta get on this train! Not only do I always add them for their taste, I make them a staple in my daily diet because they are super high in Omega-3’s and other healthy fatty acids that are hard to come by these days (especially flax). Oh berries, do I need to explain? They make any flavor of overnight oats better so just find your favorite, what is available or in season and throw those suckers in! I really do not like eating oats ever without banana.. I just love banana that much! Walnuts, Chopped Dates, Raisins, dried figs, peanut butter, almond butter, coconut, fresh fruit. I highly suggest making enough oats for at least 2 days, it cuts back on time and tastes even better on the second day - as long as you don’t add the banana until the day you eat it! In a jar or bowl of choice, mix all ingredients except non-dairy milk until combined. Next add the non-dairy milk and stir. Cover and place in the refrigerator for 2 hours or overnight. Remove from the refrigerator and eat cold! Note: If oats are too liquid when you remove them in the morning, you can add another tablespoon chia seeds and allow to soak 5 more minutes. This will thicken it up. Try combining about 2 cups rolled oats with 3 cups non-dairy milk of choice and adding additional ingredients to taste using the previous recipe as a guide. Make it Easy to Store! I always make big batches and store it in Jars or a large tupperware in the fridge to keep for 2-3 days.